Fairytale Flower Princess Dress is true princess dress perfect for Halloween party or princess party. 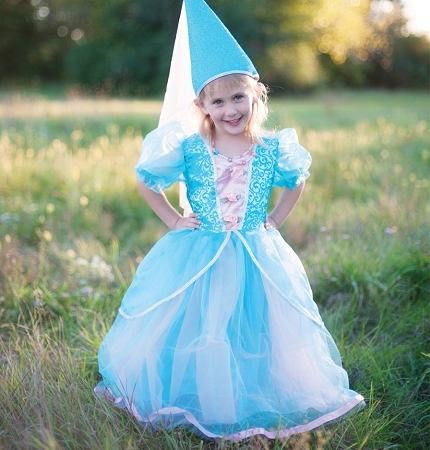 Fairytale princess dress features turquoise satin damask with blue and pink tulle cascading down from the waist. The dress includes a matching princess hat, topped with satin flowers and soft tricot. Organza sleeves and bustles add extra fancy princess look! This dress comes in size medium. For sizes please refer to Size Chart.